LG Optimus L70 MS323 user guide manual for MetroPCS – LG OptimusL70 MS323 was released on April 2014 came with simple and easy device to hold. LG Optimus L70 come with specifications and key features just like another L serie, LG Optimus L90. Knockcoe security system is new feature for LG Optimus L70 support with 1 GB of RAM with Android 4.4 KitKat operating system and users will easy to do simple tasks. LG Optimus L70 equipped with specification and key features such as: 127.2 x 66.8 x 9.5 mm (5.01 x 2.63 x 0.37 inches) in dimension with 124 g (4.37 oz) in weight, 4.5 inches IPS LCD capacitive touchscreen display 16 million colors 480 x 800 pixels screen display with multitouch support and Corning Gorilla Glass 2 protection, microSD up to 32 GB, 4 GB internal storage, 1 GB of RAM, 5 megapixel rear facing camera with autofocus and LED flash, 0.13 megapixel front facing camera, run Android 4.2 Kitkat operating system, powered by 1.2 GHz dual core Qualcomm MSM8210 Snapdragon 200 processor and Li-Ion 2100 mAH battery. LG Optimus L70 pdf manual available to download in pdf file format with 4.5 MB size and contains of 114 pages. 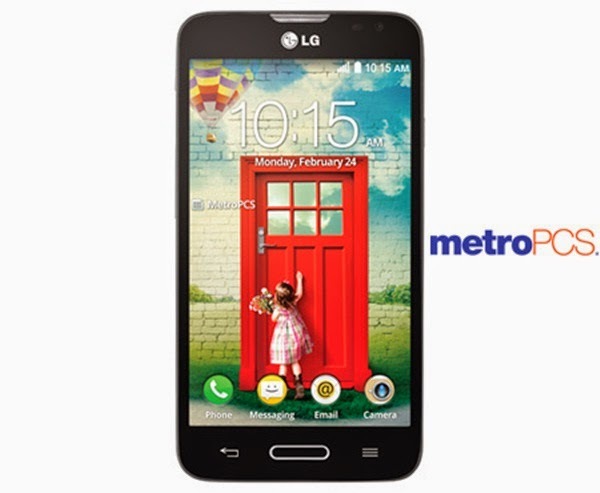 LG Optimus L70 user guide manual for MetroPCS will help users, owners and buyers with important information you need about the smartphone including key features, add functions, settings and some solution for troubleshooting.